Several overlapping political and economic agendas are unfolding. Is the shutdown –implying the furloughing of tens of thousands of public employees– a dress rehearsal for the eventual privatization of important components of the federal State system? A staged default, bankruptcy and privatization is occurring in Detroit (with the active support of the Obama administration), whereby large corporations become the owners of municipal assets and infrastructure. The important question: Could a process of “State bankruptcy” –which is currently afflicting local level governments across the land– realistically occur in the case of the central government of the United States of America? This is not a hypothetical question. A large number of developing countries under the brunt of IMF “economic medicine” were ordered by their external creditors to dismantle the State apparatus, fire millions of public sector workers as well as privatize State assets. The IMF Structural Adjustment Program (SAP) has also been applied in several European countries. Will this gamut of deadly macro-economic reforms engineered by Wall Street and the Federal Reserve be conducive to widespread civil disorder across the United States? Flash back to the meltdown of Wall Street in September 2008. In the wake of the economic crisis, a process of fiscal collapse was initiated. The evolving fiscal crisis had set the stage. It has a direct bearing on the issue of shutdown of the federal government and “debt default”. The Bush and Obama bank bailouts had led to the appropriation of $1.45 trillion of US tax revenues. This money was channeled to Wall Street under Bush’s Troubled Assets Relief Program (TARP) and Obama’s bailout program initiated at the outset of his first term. This money was transferred to the banks. Meanwhile, “defense expenditure” in support of a war economy had spiraled: 740 billion dollars had been allocated (FY 2010) to fund a vast process of militarization including America`s wars in the Middle East and Central Asia. Of significance, there were several other unreported shadowy multibillion dollar bailouts which do not appear in government accounts, not to mention the Pentagon’s black budgets which are not included in the official expenditure accounts of the Department of Defense. In the wake of the 2008 financial crisis, a new structure of public indebtedness had been created. Without accounting for the “black budgets” and “shadowy bank bailouts”, reported defense expenditures plus the bank bailouts amounted to a staggering 2.35 trillion dollars. Total revenue in FY 2010 was of the order of $2.38 trillion. In other words, these two categories of expenditure, namely War and Wall Street “had eaten up” (together with interest payments on the public debt) the totality of federal government revenues. The $2.35 trillion included the handouts to the banks plus military expenditure and the funding of the multibillion dollar DoD contracts with Lockheed Martin, Raytheon, Northrop Grumman, British Aerospace, et al. What this warped budgetary structure implied (in FY 2009 and 2010) was that there was no money (i.e. residual funds) “left over” from the public purse (tax revenues and other sources of federal government revenue) to fund regular government programs. All other categories of expenditure including medicare, medicaid, social security as well as public investments in infrastructure, etc. had to be financed through debt creation (emission of Treasury bills and government bonds), namely through a dramatic increase in the public debt from $9.9 trillion in FY 2008 to 16.7 trillion (October 2013), a staggering increase of almost 70 percent. In essence, the federal government has been financing it own indebtedness through generous handouts to Wall Street and the military industrial complex. These developments are also characterized by a widening budget deficit in the wake of the 2008 financial crash. 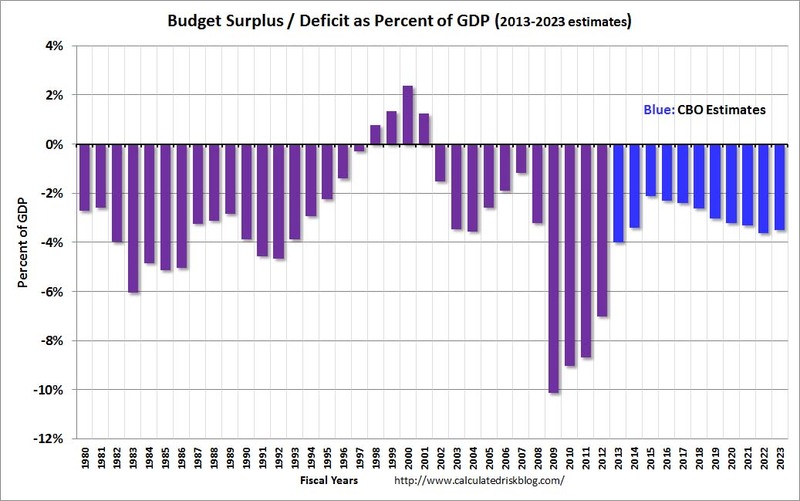 (See CBO graphs below, which indicate the figures for the budget deficit as well as the forecast for 2012-2022). The Congress Budget Office (CBO) contends that the “estimates” for 2013-2022 are based on revised historical values of Gross Domestic Product by the Bureau of Economic Analysis (BEA). This is a nonsensical statement. Yet the Congress Budget Office (CBO) also acknowledges that “the federal budget deficits [2013-2022] are now expected to shrink dramatically”. These are not our words but those of the CBO. And these “forecasts” have nothing to do with revised historical values of GDP. The have to do with austerity measures and macro-economic policy. In a matter of three years, according to the CBO “forecast”, the budget deficit will be reduced from 7 percent of GDP in 2012 to 2 percent in 2015. A budgetary shift of this nature can only be implemented by “economic shock therapy” leading to socially devastating cuts in public expenditure, which will inevitably result in a wave of civil unrest. Built into these “forecasts” is the presumption that drastic austerity measures leading to major cuts in government spending will be carried out over a ten year period (2013-2022) thereby reducing the size of the budget deficit as well as its percentage ratio to GDP. We are not dealing with statistical concepts, the CBO “forecasts” through these 2013-20122 figures a process of fiscal disintegration and impoverishment of the American people. The so-called CBO “estimates” for 2013-2022 are based on the assumption that austerity measures (which have not yet been formally adopted) will lead to the downsizing, phasing out and/or privatization of a large number of State programs including medicare, medicaid and social security. How else would it be possible to slash the budget deficit from 7 to 2 percent of GDP in 3 fiscal years? Medicare, Medicaid and Social Security represented in FY 2012, 45 percent of total government expenditure (See CBO Chart on Federal Government Spending for FY 2012, below). “The US House of Representatives has passed a bill that would slash food stamp funding by nearly $40 billion over ten years, kicking four million people off the program next year. It is highly unlikely that the budget of the Department of Defense (19 percent) will be used to reduce the budget deficit. In a bitter irony, while the Wall Street financial institutions were the recipients of the bailouts, they are also the creditors of the federal government, which had been precipitated into a structure of deficit financing controlled by Wall Street. This deficit financing –which was facilitated by Quantitative easing– is distinct from the Keynesian framework. It is controlled by the creditors. It does not create employment, it is not expansionary. It has little bearing on the real economy. This post 2008 fiscal structure has had a fundamental impact on the process of debt formation. Tax and other federal government revenues had been assigned in 2008-2009 to bailing out the banks while relentlessly funding the war economy including the financing through black budgets of a growing number of Private military and security companies (PMSC). The public debt has increased by almost 70 percent in five years, from 9.9 trillion in 2008 to 16.7 trillion in 2013 (October 2013 estimate of the debt ceiling, see graphs above). The various phases of Quantitative Easing (QE) throughout the Obama presidency were largely intended by Wall Street to keep the ship afloat, with an increasingly larger share of the debt owned by the Federal Reserve (in the form of Treasury bills). The Fed has largely been involved in propping up its assets. The Fed is not a publicly owned central bank; it is a network of 12 private US banks, with the New York Federal Reserve Bank playing a key role. Operating under a semi-secret veil, major Wall Street financial institutions (including the big four) are the “stakeholders” of the Federal Reserve, which ultimately call the shots on Capitol Hill. At the outset of the Obama administration in 2009, The Federal Reserve Banking system (which is an unaccountable private entity) has been granted increased authority in its management of the US economy, overshadowing the prevailing system of public regulation of the financial system, as well as reinforcing the subordinate role of the US Treasury in relation to Wall Street. Policies pertaining to the shutdown of the government and the statutory debt ceiling are determined by Wall Street and the Federal Reserve, the US government’s largest creditor. 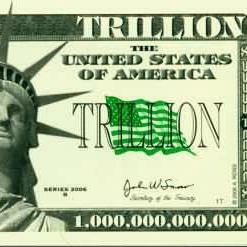 The Federal Reserve banks currently holds $2.1 trillion of US public debt. Japan and China respectively own 1.1 trillion and 1.3 trillion of the US public debt. 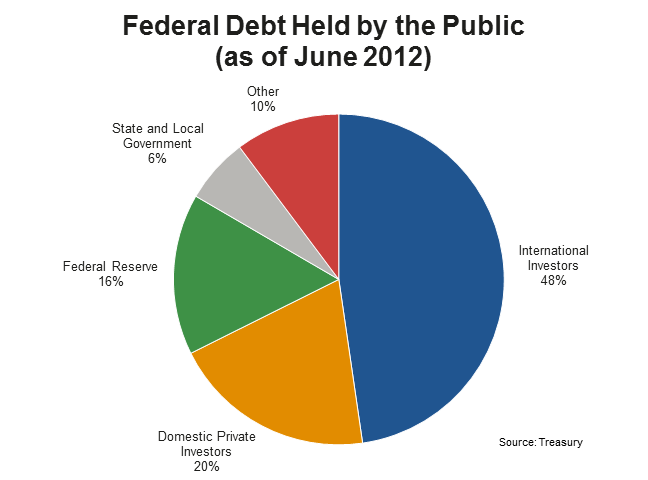 Based on Jun 2012 figures, The Federal Reserve owns 16 percent of the Federal Debt held by the Public. The New York Federal Reserve Bank (the largest of the Federal Reserve banks) holds a significant portion of the total holdings of the Federal Reserve system composed of 12 constituent banks. Were the Federal Reserve to be a publicly owned central bank, quantitative easing would have an entirely different dynamics: the government rather than the Fed (acting on behalf of Wall Street) would be calling the shots. Under a publicly owned central banking arrangement, two trillion dollars worth of public debt could be cancelled, thereby creating conditions for the funding of social programs. The result of these macroeconomic reforms has been mass unemployment. The American people –including the middle class– have been impoverished by the Wall Street establishment, which ultimately decides on debt default and the statutory ceiling placed on the public debt. State programs can either be downsized, phased out or transferred out of the public purse to the private corporate sector, implying in all cases the layoff of tens of thousands of public employees. No major reforms of the structure of indebtedness are contemplated by the US Congress, which could meaningfully change the government’s relationship to the Federal Reserve and its Wall Street handlers. The creditors ultimately decide. What is contemplated are marginal modifications of the status quo including legislation to push the debt limit to December 31st 2014. This token arrangement would temporarily increase the federal government’s borrowing ability through the issuing of Treasury bills and government bonds by about one trillion dollars. Under this scheme, however, the powers of the Wall Street Banks and the New York Federal Reserve would not only be maintained they would be reinforced. The ultimate objective is to develop a full-fledged proxy State under the helm of the financial establishment. Both the Executive as well as the US Congress are to remain under the control of Wall Street. The Privatization of the American State? the possible phasing out and/or curtailment of social programs, the privatization of large sectors of public sector activity. The fiscal ceiling having now been reached, possibly with a deadline, the government is being pressured by its Wall Street handlers –who control decision-making in the US Congress– to curtail and downsize social programs as well as initiate the transfer of public assets and institutions into the hands of private corporations. There is also a movement to cut as well as privatize Social Security and Medicare. The privatization of public monuments, museums, national parks, the post office, etc. has been raised in recent media reports as a possible “solution” to the debt crisis. But let us not be misled: the process of acquisition of federal public property including infrastructure and State institutions is likely to go much further. The public sector is up for grabs. Wall Street will eventually go on a buying spree picking up State owned assets at rock bottom prices. Ironically, the money transferred by the US government to Wall Street under the bailouts in 2008-2009 can now be used by Wall Street to buy out state property and assets. What this means is that the federal government not only finances its own indebtedness, it is also financing the privatization program (at tax payers expense), leading to the demise of federal government programs. The proceeds of the privatization program are channeled to the State Treasury to meet outstanding debt obligations. In Brazil in the 1990s, important state assets in mining and forestry were purchased by Citi Group, which was Brazil’s largest foreign creditor bank. Ironically, the proceeds of the privatization of the assets purchased by Citi Group were channeled back to Citi Group in the form of debt servicing. Existing state programs are transferred to private corporations either through outright sale of state assets or through outsourcing of government services to the private sector. Large numbers of government employees would be laid off as a result of restructuring and privatization. Government services would be sold to the public at a much higher price. In California, the Orange County Employees Retirement System is estimated to have a 10 billion dollar unfunded pension liability…. … Pension consultant Girard Miller told California’s Little Hoover Commission that state and local government bodies in the state of California have $325 billion in combined unfunded pension liabilities. The privatization of federal State assets on a significant scale as well as the take over and privatization of public services is the next stage of this socially devastating economic restructuring process. There is another related agenda, which will be the object of a forthcoming article. The uncertainty underlying the government shutdown and debt default is the object of a wave of speculative activity on major markets. Wall Street financial institutions not only exert a decisive influence in the formulation of the Administration’s fiscal and monetary agenda, they also control the movement of currency markets, commodity and stock markets through large scale operations in derivative trade. Most of the key actors in the US Congress and the Senate involved in the shutdown debate are controlled by powerful corporate lobby groups including, of course, Wall Street. The latter are those which ultimately decide on the outcome. They are not only in a position to influence the results of the Congressional process, they also have foreknowledge of the nature and timing of key decisions and they are in a position to reap multibillion dollar speculative gains in the derivative markets by speculating on policy outcomes of which they have advanced knowledge. While Wall Street is instrumental in triggering the debt ceiling impasse, major financial institutions will also be placing their bets in large scale speculative transactions. He is the author of The Globalization of Poverty and The New World Order (2003) and America’s “War on Terrorism”(2005). His most recent book is entitled Towards a World War III Scenario: The Dangers of Nuclear War (2011). He is also a contributor to the Encyclopaedia Britannica. His writings have been published in more than twenty languages.